Dahl (or more specifically, Tarka Dahl) is just one of those dishes that changes slightly every time I make it. Sometimes its the spices that get chucked in, sometimes is the amount of water; I’m just not a very consistent or specific cook. This probably means I should steer away from posting recipes on myfoxycorner, but I have been wanting to share more of the vegetarian meals that we love, which tick the boxes health-wise but are also delicious enough to keep a meat-eater satisfied (at least for a night). You know those meals that bring back vivid memories? Dahl will always take me back to my childhood, it was one of the few recipes my mum would make (after a stint in Fiji where she became pretty handy with the spices) and something that we could eat for days on end when there was no money for meat or fresh produce. Its a nourishing meal, in every sense of the word. This is the grown up version of budget eating for the poor adult student, or perfect winter meal for the hungry vegetarian, or the saviour for the exhausted mum with 4 kids with big appetites, or the perfect adventure for a meat free Monday. Its pretty great. Dahl is wonderfully warming and ideal for these colder months. The subtle spices and rich lentils create a true comfort food, and its also easy, cheap and perfect as leftovers. This is definitely one vegan meal that ticks all the boxes. Okay, so my recipe probably (definitely) isn’t 100% authentic, but it’s a one pot wonder that is so low-fuss and delicious, I don’t even care). 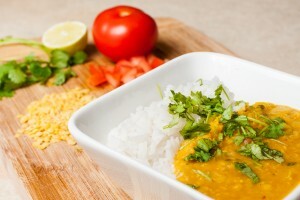 Easy Almost-Indian Dahl (serves approx. 4 hungry flatmates). Heat some oil in your pan/pot and fry off the onion until it softens on a high heat. Add in the garlic, ginger and spices and continue to fry for around a minute or 2, this releases the flavour of all the spices and is probably the most important step of any good curry. Lower the heat and add the lentils and the stock, along with the chilli, and leave until the lentils are completely cooked (approximately 20-30 minutes). You need to keep an eye on this and give it a stir every now and again, so don’t get distracted. It may look like a soupy mess, but the lentils are going to expand and soak up all that spicy stock, don’t even worry about it. 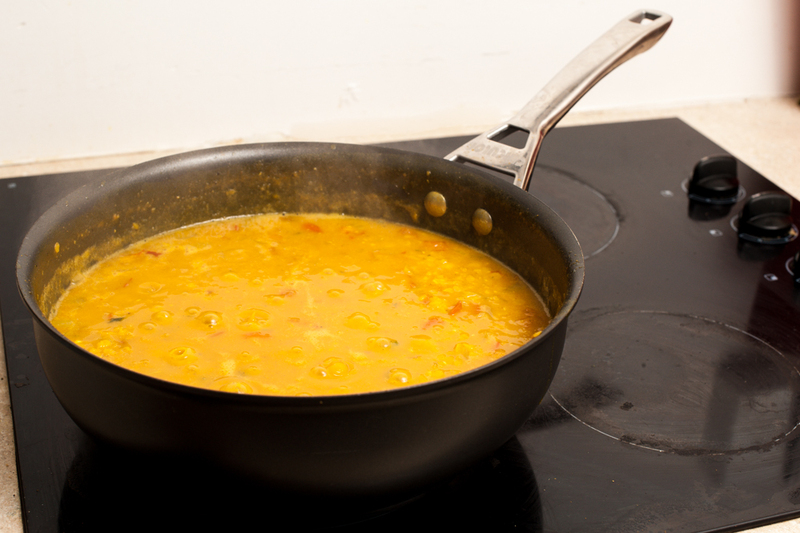 Once the lentils are cooked, you can add a bit more water if you prefer your dahl a bit soupier, or leave it thickened. This is totally up to personal preference, I tend to like something in between a soup and a curry and add water as I go to get the perfect consistency. Add the tomatoes towards the end to prevent them completely disintegrating (like they did for me). You could also add frozen peas here if, like me, you have a pea problem and find a way to include them in every meal. I also add a generous squeeze of lemon juice (or lime) to add a little acidity and freshen it up. 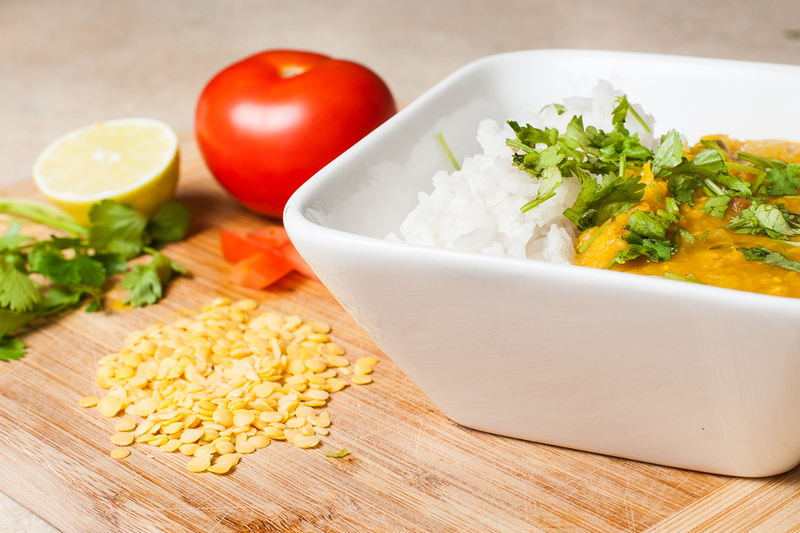 Lastly, add some fresh, chopped coriander and then serve either by itself or with cooked rice. You could also add some plain yoghurt (a delicious creamy contrast to the earthy, spiced lentils), but I wanted to keep this dairy free. Eat the dahl way too quickly and then wish you could eat more, but you can’t because you’re supposed to be taking it for leftovers tomorrow. Lentils are a pretty amazing part of a vegetarian/vegan diet, so if I could just for one second put on my lentil appreciation hat…they’re are an amazing protein source (without all the fat and cholesterol of meat), contain heaps of fibre and are full of nutrients. The best thing about lentils is that they are ridiculously filling, but also really low in calories. 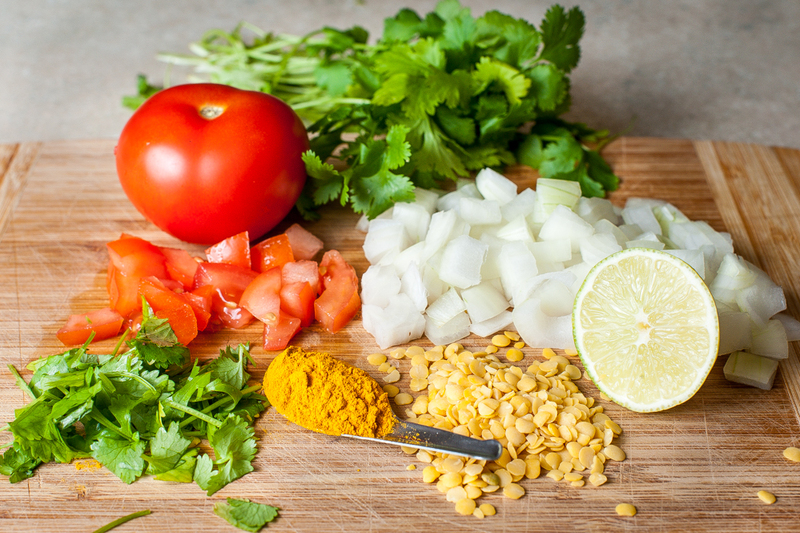 Dahl is one very easy way to incorporate them into the diet, and it’s the perfect thing to try during the colder months when a spicy, warming curry becomes as attractive as Ryan Gosling in a cardigan. Dahl will always be one of my favourite meals. It costs next to nothing and yet tastes like heaven. Also, for something that tastes so complex, it only needs around about half an hour to prepare (just don’t forget to cook your rice because you were too busy being proud of yourself for making a home-cooked dinner instead of getting burger fuel). Let me know if you give it a try! What’s your go-to winter meal?